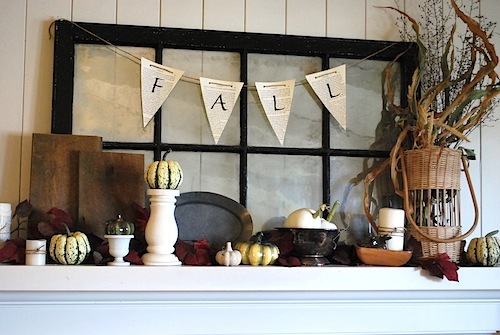 Did you know that in about 15 minutes – and using things you may already have – you can create a simple banner for any holiday or season that not only looks awesome, but will make people think you are a decorating queen? Seriously, when people see your holiday book page banner, they will comment and mention all the time you must’ve spent on your decor. And you can just smile and say, “thank you,” all the while knowing you spent less time than it would take to drive to a store and buy something. Something that would probably be way cheesier at that. 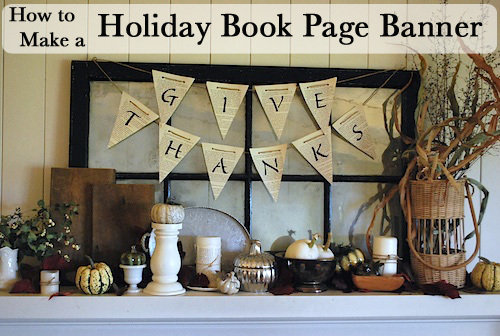 Book page banners are my go-to decorating favorite because they can be made up so quickly, are easy to customize to say anything, and fit with any decor no matter the season or holiday. They can be as simple as you like, or fancied up with lace, glitter, burlap or other fabric. They are even something that kids can help with, too. So, if you’ve got a few minutes and the supplies below, how about impressing your family and friends and use a book page banner to decorate for the holidays? Draw a triangle on one book page by finding the center at the bottom of the page with a ruler, marking it, and then using the ruler to draw a line from the center point out towards each top corner of the page. Cut this triangle out (it will be your template). Lay the first triangle on top of 2 or 3 stacked pages and cut out more triangles. Repeat until you have enough for each letter of your desired banner. 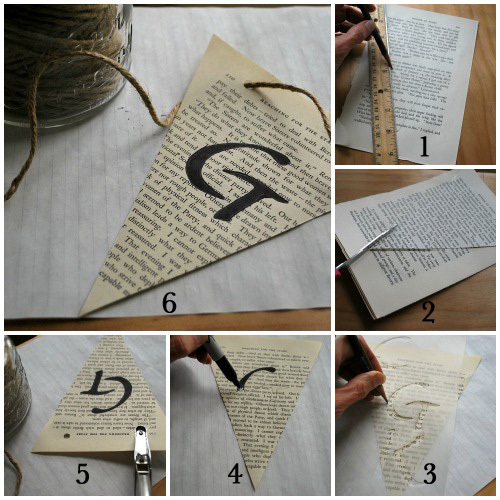 Trace a letter with a pencil on each triangle using a stencil. Repeat for all letters needed. Use sharpie or other marker to fill in traced letter. If using a permanent marker, be sure to have a scrap piece of paper under the triangle to catch any marker bleed-through. Punch two holes in the top of each triangle, about an inch in from each corner and about 3/4″ down from the top. Cut a piece of twine (or ribbon) long enough to hang where you’d like it and thread the triangles onto the twine. Use push pins or small nails to hold banner in place (if using on a wall temporarily, like a birthday banner). Tape works, as well. There you have it. Can you think of ways to customize this idea? You can even move beyond book pages by using maps, children’s books, or any number of papers. Sky’s the limit, so have fun!